I’m working on a kabillion things!! Slowly adding more things to the shop. Tomorrow some more cupcake hats are going up! 9 Responses to Sending you some sugar. 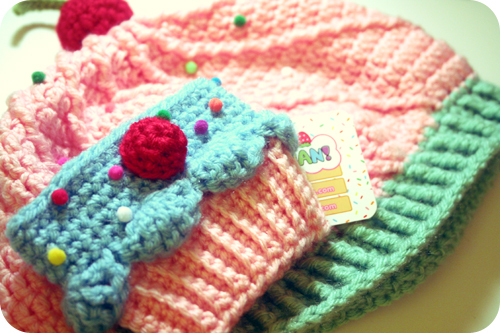 ooh cupcake hats! i might need one to add to my cupcake coffee cozie and cupcake phone cover collection! well, I believe I was very sleepy this morning when I made the comments; I thought you were doing a GIVEAWAY! 😉 ha ha ha…..I think if you were there would be a TON of comments! I had to tell you: I was in the car with my boyfriend a bit ago and saw you & hairy walking out of Home Depot. Haha too funny! Say hi next time!!! 😀 I am trying to make a point of taking photos with peeps I run into in the ‘hood , so I can blog about them :). I get stopped at all kinds of random places, like the parking lot outside of Trader Joe’s in the SOMA. Or inside a random bookstore. It’s fun!